Adopted on May 30, 1995. Conference on Herpetology worked to have a bill passed naming the Tennessee Cave Salamander, (Gyrinophilus palleucus,) the State Amphibian of Tennessee and, in 1995, It was adopted as the Official State Amphibian by Public Chapter 367 of the 99th General Assembly and signed by Governor Don Sundquist on May 30, 1995 with an effective date of June 12, 1995. 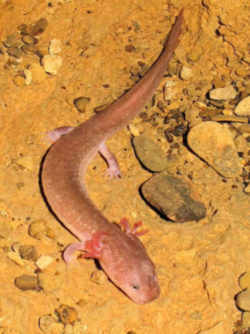 This large, cave dwelling salamander has three red external gills, a broad, flat head with small eyes and a tail fin. It usually does not metamorphose out of its aquatic larval stage, and hence has large feathery gills throughout its life. Its body is pale blue or pink, and its eyes have been reduced to dark spots. The reproductive organs develop inside the "larval" body. 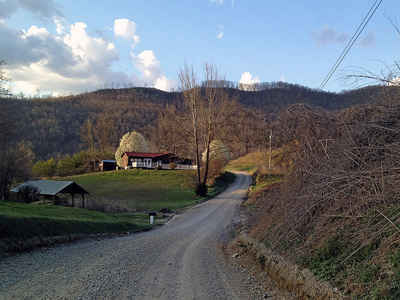 It is most often found in limestone caves that contain streams in central and southeast Tennessee. This species was first described by E. McCrady, a former Vice-Chancellor of the University of the South. The Tennessee Cave Salamander (Gyrinophilus palleucus) is an endangered species and is now rarely spotted in caves. 4-8 7/8" (10.2-22.7 cm). Cave-dwelling "gyro" that retains its larval characteristics. Bright-red external gills; small lidless eyes; large tail fin. Snout broad, turned up at tip. Stout body ranges from nearly white to dark brown with spots. Costal grooves, 17-19. Their legs are nearly equal in size, their tails are long, and they have no external gills. 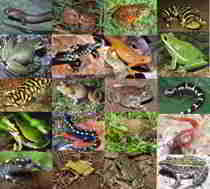 This is the most diverse family of salamanders in the world, with over 200 species. The greatest concentration of species is found in the Appalachian Mountains of eastern North America. They are called Lungless Salamanders because they have no lungs and absorb oxygen through the skin and the lining of the mouth. Big Mouth Cave Salamander (G. p. necturoides), brown to purplish with heavy spotting; Big Mouth Cave, Grundy County, Tennessee. Poorly known. The reproductive organs develop inside the "larval" body. Most species of salamanders have internal fertilization and lay their eggs either in water or in moist locations on land. Larvae generally develop in water and have external gills during development. In one family, the young develop fully within the egg and emerge as tiny adults. 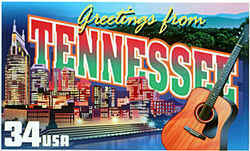 It is most often found in limestone caves that contain streams in central and southeast Tennessee. Salamanders are found in a variety of habitats, including streams, swamps, marshes, forests, caves, and rock ledges. 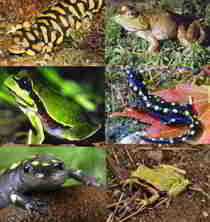 Most adult salamanders are terrestrial. South Eastern and Central Tennessee and Northern Alabama. The Berry Cave Salamander (Gyrinophilus gulolineatus) used to be considered a subspecies of Tennessee Cave Salamander. The law designating the Tennessee cave salamander as the official Tennessee state amphibian is Section 4-1-320 (State amphibian ) of the Tennessee Code, Title 4 (STATE GOVERNMENT) Chapter 1 (GENERAL PROVISIONS) Part 3 (STATE SYMBOLS) Section 4-1-320. 4-1-320. State amphibian. 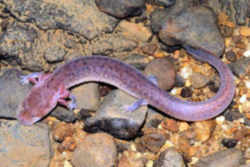 The unique Tennessee cave salamander (Gyrinophilus palleucus) is hereby designated as the official state amphibian.